Britons go to the polling stations to vote on whether the UK will stay in the European Union. Polling started at 7 a.m. BST and will end at 10 p.m. BST. An estimated 46,499,537 people are entitled to take part in the vote. One TNS poll conducted online from June 16 to 22 puts Remain at 41% (+1 in comparison with the previous poll) and Leave at 43% (-4). Terrible weather across some parts of Britain, particularly in London and the South East, could affect turnout. This page was updated continually throughout the day. For further updates go to our new live blog. We have now migrated over to a new live blog ahead of polls closing at 10 p.m. Make sure to check it out for updates on counts as soon as they start coming in, as well as a YouGov poll anticipated to come out soon after 10 p.m. which will give a good indication of people’s final voting intentions. As polling begins to draw to a close, spare a thought for Kay Cutting. 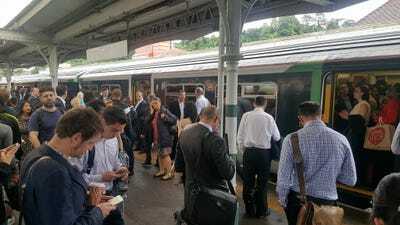 The Financial Times reported earlier in the day that the 55-year old teacher faced an epic journey to vote in Forest Hill, south London, for her and for her daughter by proxy. Cutting then had to drive three hours cross-country to Worcester so her other daughter could vote, after registering at the wrong address. Polls in Gibraltar are now closed. The island state off the coast of Spain is considered part of Britain, so citizens were allowed to vote, but the island is one hour ahead of the UK, so polls have now shut. On the British mainland and in Northern Island, there is now just under an hour to go before polling closes. Courtesy of polling guru Mike Smithson. Ladbrokes has provided a handy update on its latest odds for whether Britain will vote to stay in, or leave the European Union tonight. The bookmaker suggests that there is currently a 19% chance of a Brexit. 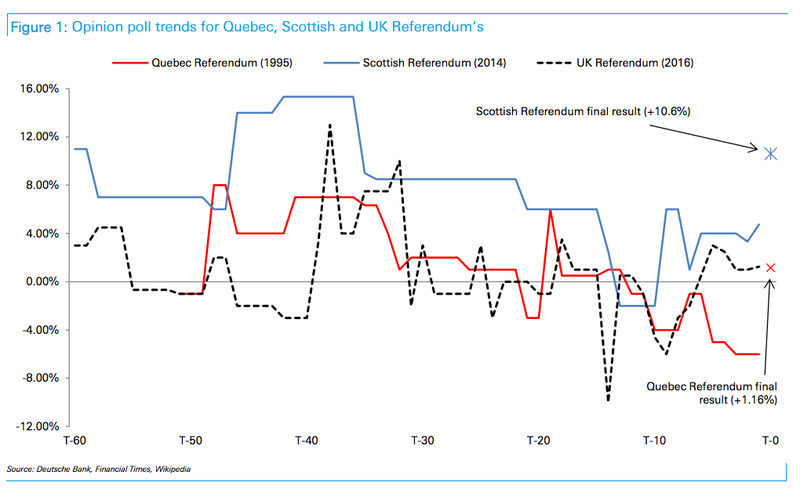 2014 — WHAT WILL HAPPEN IN THE MARKETS IF THERE IS A BREXIT? HSBC predicts that the price of gold will rocket as investors rush to the “safe-haven” asset. Deutsche Bank says that UK stocks may actually outperform stocks on mainland Europe. There are now only two hours until polls across the United Kingdom close. 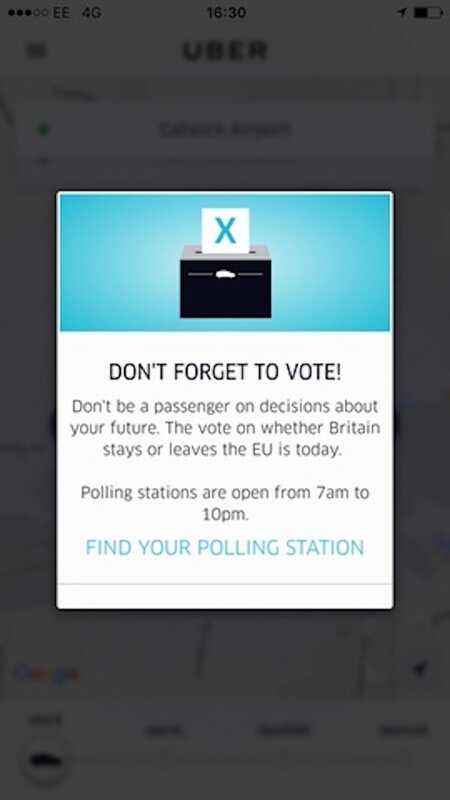 If you are struggling to get back to your polling station in time because of travel chaos, the Electoral Commission has a friendly reminder that even if you are queuing outside a polling station at 10 p.m. you will still be allowed to vote. Regardless of how things go in the referendum, pro-Brexit campaigning group Leave.EU is having a big old party. The campaign group, which lost out to Vote Leave as the official Leave campaign, will be toasting the referendum, along with all volunteers and campaigners on the side of Brexit. UKIP leader Nigel Farage is expected to speak at the event in Millbank, close to Westminster. Several journalists are also attending so expect updates throughout the night on Twitter. As Business Insider’s Ben Moshinsky reported earlier today, it might be a good time to buy euros for your holiday ahead of the result. We may not have any real idea of how voting is going in the referendum until polls close at 10 p.m, but we can update you on the progress of Brexit the horse. A racehorse called Brexit ran in the 6.10 race at Newbury, finishing sixth overall. A man was stabbed in Greenhead Park in the town, before collapsing near the Waverley Road polling station, according to the Huddersfield Examiner. A 19-year old man has been arrested. The stabbing is not believed to be related to the referendum. “Police were called to reports of man with a stab wound collapsed in the street in the Waverley Road area of Huddersfield at 5.15pm. “Officers attended and found a man who had suffered what are believed to be serious but not life threatening injuries. The polling station was closed for around 30 minutes, but has now reopened. In a recent report by Goldman Sachs, two graphs point out more general problems Europe is facing. The charts show that people’s satisfaction with the EU is shrinking, as political instability has risen. Business Insider’s Elena Holodny has more on the report here. Beyond London and the South East, it has actually been a pretty nice day, in terms of the weather. Accordingly, some areas are reporting high voter turnout. 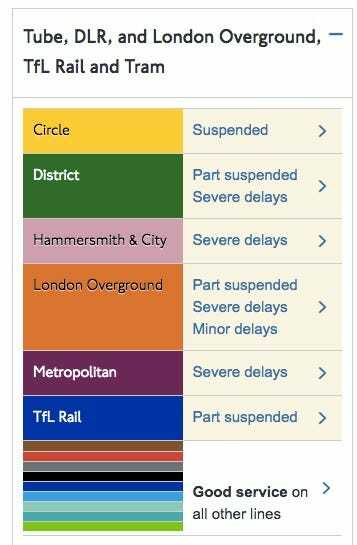 Weather in London currently biblical. Would be typical if most momentous vote in recent British history was decided by the rain. 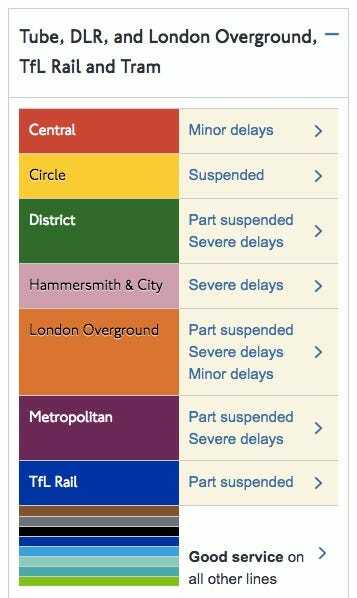 Absolute chaos all over London. This weather. It needs to naff off. It’s cricket season and Brendan needs to go big tonight. The referendum is not legally binding, so even if the Leave campaign wins Thursday’s vote, Britain may actually end up remaining in the EU, according to a report by Business Insider’s Adam Payne. It will be up to the UK Parliament to decide what to do next. But many of the most ardent Europhiles in Parliament, like the former Deputy Prime Minister Nick Clegg, have said they will respect the public’s decision, regardless of the result. 1727 — WONDERING WHAT TIME WE WILL FIND OUT THE RESULT? As the traders of CitiGroup, JPMorgan, and Morgan Stanley know only too well, we will not find out the results of the EU referendum on Thursday. Results are expected at about 6 a.m. BST on Friday. So, unlike the bankers who are being told they must stay overnight, a sensible move would be to go to bed as normal and wait until Friday to find out whether Britain has voted to leave the European Union. While we are all obsessing over Britain’s EU referendum, the much maligned president of the European Commission, Jean-Claude Juncker, has more important things going on — namely Luxembourg’s national holiday — according to a ZDF reporter. Stocks across Europe closed higher on Thursday during a wet day of voting in the UK. All of the major indexes ended positively — while some gained more than 2.5%. 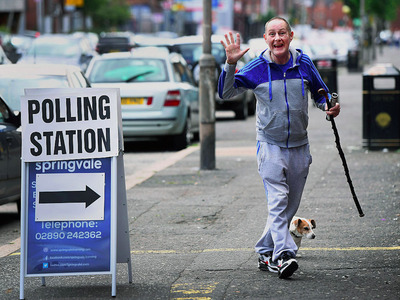 Charles McQuillan / GettyAn EU referendum voter heads to a polling station in Northern Ireland. A concerned mother from Rainham, east London, called the police earlier to report that her local polling station was issuing only pencils to mark ballots papers, according to local media reports. “It just seems crazy to be using pencils. It’s not right, as it’s fairly easy for someone to erase your vote,” Lydie Abessira told the Romford Recorder. #usepens is trending on Twitter, after Brexit supporters have been encouraging supporters to use pens to avoid a rumoured MI5 plot to keep Britain in Europe. The on-demand taxi service Uber is encouraging its customers to make the trip to the polling station, despite the bad weather. The heavy rain could of course lead to big profits for the company, which operates across large UK cities including London, Birmingham, and Bristol. Voting in the EU referendum has been having a dramatic effect on the pound on Thursday. Just after 4 p.m. BST (11 a.m. ET) the sterling is about 0.7% higher against the dollar, to trade at $1.480, having reached a daily high of $1.4934 at about 11:30 a.m. BST (6:30 a.m. ET). Eligible voters in the EU referendum are not being allowed to register for an “Emergency Proxy Vote” — in which you give someone else the power to vote for you if you’re unable to make the polling station yourself for unexpected reasons on the day — as a result of travel disruptions in Europe. Electoral services won’t allow as reason for emergency proxy though which seems pretty unfair. Any suggestions? We have an answer: No, you cannot apply for an emergency proxy vote if stuck abroad due to striking air traffic control. Other voters have until 5 p.m. to register for an Emergency Proxy Vote. 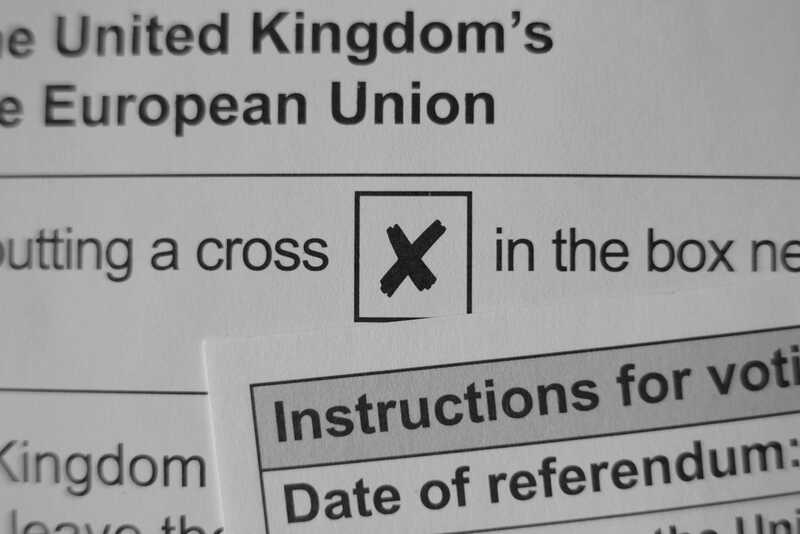 Voter turnout is seen as a crucial factor in determining the result of the EU referendum. Young people are considered more likely to vote to remain in the EU, but they are also one of the least likely demographics to actually cast a vote. Certain parts of Britain, namely London and the South East, are suffering from awful weather conditions; it’s unclear exactly how far this could affect the final outcome. WATCH: European landmarks light up with the Union Jack to show Remain support. We’re now midway through voting day, and reality is starting to dawn on voters. We will soon know the result of the EU referendum, but what happens next? Business Insider has compiled forecasts predicting the next steps in the event of either a Remain or a Leave vote. The minimum voting age in the referendum is 18. There was a move to lower the voting age to 16 for the vote on Britain’s future as a member of the European Union. But the House of Lords and the House of Commons rejected the proposal in December, The Guardian reported. Now those under 18 are expressing frustration at their inability to have a say on the decision, which will affect Britain for many years to come. The London Fire Brigade have given an update on disruption caused by flooding Thursday in Romford. As of 2 p.m. the service say they have rescued 110 residents. The emergency service received more than 550 weather-related calls overnight. “We are expecting more heavy rainfall later today and so possibly more localised flooding. However, we are working very closely with other agencies to protect people and property,” station manager Rod Vitalis said in a press release. The poor weather conditions in the UK are expected to influence turnout at the EU referendum. Traders at several major banks including JPMorgan, Morgan Stanley, Citigroup, and Goldman Sachs have been asked to stay at work all night on Thursday because of the EU referendum, according to reports. A conspiracy theory about an MI5 plot to rig the referendum has led Brexit supporters to urge voters to make their votes using pens — to make sure their ballot papers cannot be edited after the vote. Jacqueline Jackson, who describes herself as a UKIP supporter, posted a video on Twitter of her being questioned by the police, as a result of her handing out pens to voters outside a polling station. The multinational banking firm Goldman Sachs has set out to investigate the causes of an increasingly volatile political atmosphere, which is having a major impact on the international markets. David Brady, a political-science professor at Stanford University, gave the bank this answer. The FTSE 100 is up over 1.6%, reaching 3,027.65. Keep checking our market post here, for the latest updates. #dogsatpollingstations may be trending, but a similar phenomenon is happening with nuns. While there are not quite as many posts on Twitter about #nunsatpollingstations, the results are just as good. 1349 — HAVE YOU BEEN UNABLE TO VOTE FOR AN UNEXPECTED REASON TODAY? YOU CAN STILL APPLY TO VOTE BY PROXY UNTIL 5 p.m. Anyone can be registered to vote for you by proxy, as long as the person is at least 18 and registered to vote. 1315 — WHAT ARE YOU NOT ALLOWED TO DO WHILE INSIDE THE POLLING STATION? There are all kinds of strange rules on polling day, which could make your seemingly innocuous behaviour technically illegal, or at least against the Electoral Commission’s rules. We compiled a list of seven polling day activities that could lead to you being asked to leave the polling station, or even land you in trouble with the law. Welsh politician Leanne Wood has cast her vote in Tonypandy, south Wales. The leader of the Welsh Independence party has been a prominent figure in the run-up to the EU referendum. “Residents in Leighton Buzzard were unable to have their say after they were told they were not included on the registration list. @Ned_Donovan @CityWestminster ok. On the phone they said ‘no’. But surely this proves the answer should have been ‘yes’. Tech reporter Sam Shead says the Silicon Valley giants Google and Amazon could significantly pull back on their UK operations if the country votes to leave the European Union. Voters should bring along pens to EU referendum polling stations to avoid an MI5 plot, according to Leave campaigners, cited by The Independent. Backers of Brexit are urging people to write in pen and make sure that their ballot papers can’t be erased after the votes have been cast. Gibraltar is a British overseas territory, historically claimed by Spain. Here Gibraltar’s chief minister, Fabian Picardo, and his wife, Justine Olivero, prepare their ballots before casting their votes in the EU referendum. And as a result, the Conservative party campaign headquarters flooded. A really crucial detail about the EU referendum has gone virtually unmentioned, and it is probably the most crucial detail: Parliament does not actually have to bring Britain out of the EU if the public votes for it. That is because the result of the referendum on Britain’s EU membership is not legally binding. It is merely advisory, and in theory it could be ignored by UK government. For more on this see Business Insider’s intriguing interview with the University of Westminster’s Peter Catterall: This is why a Brexit will most likely not actually happen even if the public votes for it. 1154 — SHOULD YOU CHANGE GET YOUR HOLIDAY MONEY TODAY? Over the past month, holidaymakers have wondered whether they should change their pounds into euros or US dollars ahead of the EU referendum. Ben Moshinsky has written a simple guide explaining why it may be best to change your holiday money on Thursday. People are posting pictures and videos on Twitter of flooding. Bad weather is historically bad for voting turnout. After all, if you can’t physically get to the polling station, how will you cast your vote? Biggest vote of my life.. Earlier, it was confirmed that two Kingston-Upon-Thames polling stations were closed because of flooding. But in all seriousness, if you mark a “√” in the ballot form box, it will render the ballot “spoiled.” Your vote won’t count. 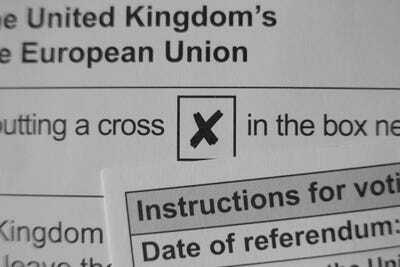 An EU referendum postal vote ballot paper. The FTSE 100 is still jumping — up about 1.5%, reaching 6,357.12. Keep checking our market post here, for the latest updates. The weather may be terrible, but many of those who have already made it to the polling stations are flooding social media, mainly Twitter, with pictures of their dogs waiting patiently outside. Flash flooding and thunderstorms are hitting rail networks. Here is the latest. But it’s not just public transport that is suffering — the roads are being flooded too. As we posted earlier Thursday morning, Business Insider has written a couple of reports that include forecasts on what will happen in the event of a Remain and Leave vote. Unless your pooch is a guide dog, you are unable to bring your pet into the polling station. 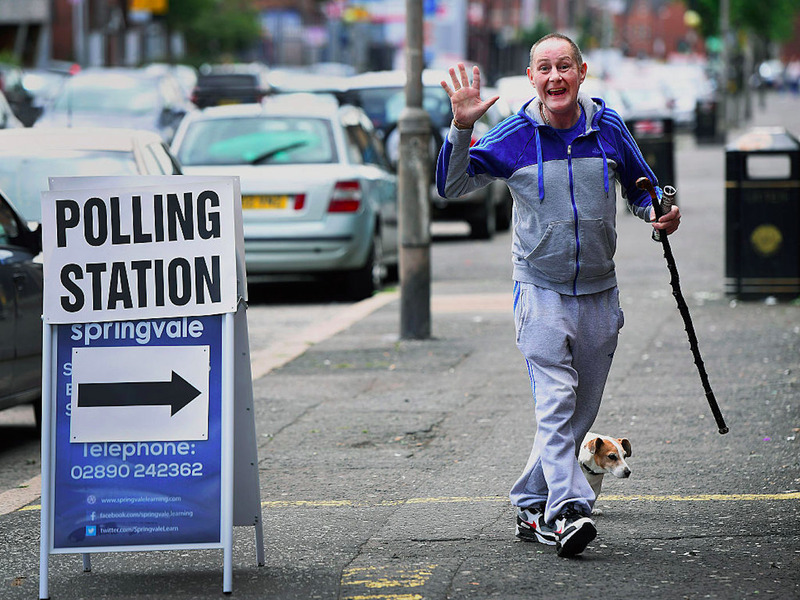 This has led to a now longstanding tradition of people taking cute snaps of their dogs outside the polling stations. Of course, Business Insider will bring you a selection of the best snaps later on. This led to a stronger remain vote than had been forecast. 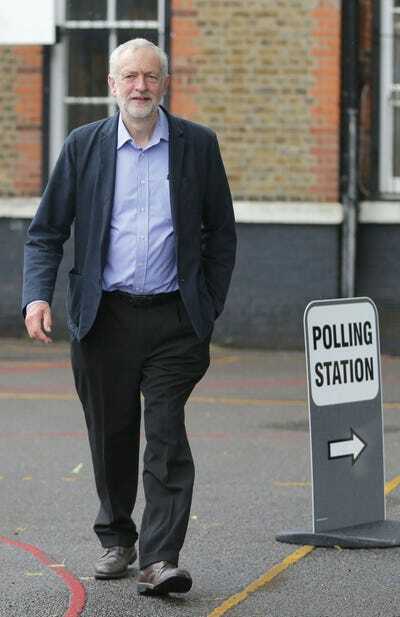 Voters in Britain are able to choose whether to vote by post or in person. Edinburgh Council said nearly a fifth of the Scottish city’s 345,000 voters had already done so by post. Check out our previous report on postal voting. FTSE 100: up 0.65% to 6,302 points. We cannot report which bets are happening Thursday or how people are voting until 10 p.m. BST — BUT Ladbrokes the bookmakers sent Business Insider some info about some huge bets being placed on Wednesday. The biggest single bet placed on Remain was 10 times as large as the biggest bet on Leave, according to bookmaker William Hill. The pound is rallying against the dollar on Thursday morning as Brits go to the polls in the referendum on whether the UK should leave the European Union. Remember to put an X in the box. As we detailed before, pockets of Britain are suffering from terrible weather. Historically, bad weather affects turnout. The pound has been going crazy over the past few weeks, and late Wednesday night there was a surge because of renewed forecasts that Remain was gaining support. Barclays has outlined how likely central banks around the world would be forced to intervene and calm the markets. There will be NO EXIT POLLS on Thursday evening. This means when voting stops at 10 p.m. BST, unlike the General Election, there will be no official exit polls to gauge how people have voted. However, banks and hedge funds have paid for their own exit polls. This means that only employees will be privy to the polls, which should give some inclination to how people have voted. Sky News has commissioned a survey from YouGov, asking people how they voted on the day. This will be released at 10 p.m. BST. But this is NOT an authoritative exit poll. While Londoners are navigating a sea of cancelled or delayed trains, Glasgow in Scotland seems to be fairing pretty well on the weather front. If voter turnout can be influenced by the weather then Glasgow is looking good for a high one. Luverly weather here this morning. 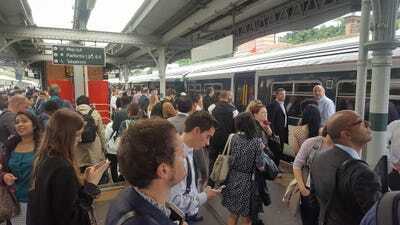 Torrential rain has already affected London’s public-transport system — and this could be a huge problem for voting turnout. Previous polling showed that London is predominantly a Remain area. Southern Rail, South West Trains and TFL rail are suffering from delays. The weather in Britain is horrendous right now — overnight there were thunderstorms and lightning, and there is now a downpour of rain. Correction: Brolly voting weather. It’s chucking it down! Doubly important to get out and vote! The Guardian says bad weather in the SE could see less people voting today. If that’s the case then the people shouldn’t be voting anyway. Polling stations are now open. Voting closes at 10 p.m. BST. The EU referendum is truly historic — an estimated 46,499,537 people are entitled to take part in the vote. This is a record number for a UK poll. 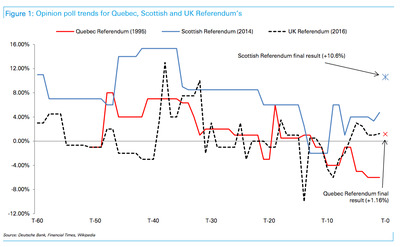 In UK history, this is only the third nationwide referendum. The votes will be counted in 382 local counting areas — representing 380 local government areas in England, Scotland, and Wales and one each for Northern Ireland and Gibraltar. 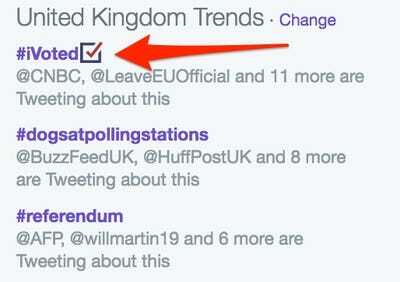 By this time Friday, we will have the result of whether the British have opted to stay in the EU. Polls published Wednesday show how close the race is. A SurveyMonkey poll from Wednesday had 50% of the 4,000 respondents opting for Remain, compared with 47% for Leave. Only 24 hours before that, another SurveyMonkey poll had Leave leading with a 1-point lead over Remain. Using methodology applied to the previous TNS poll (likely voters) gives Leave a 7pt lead. New methodology (and all voters) Leave lead by 2. Welcome to part one of our live coverage of the historic referendum on Britain’s membership in the European Union. Voting starts at 7 a.m. BST and ends at 10 p.m. BST. We will deliver all developments throughout the day, but under nationwide reporting restrictions we are unable to give an indication of how people are voting until 10 p.m. BST. At that time, when voting closes, we will bring you any opinion polls as soon as we have them, as well as the actual results as they come in throughout the night and into Friday.